The flying proas of the Ladrone Islands are among the swiftest and most extraordinary sailing boats in the world. Through ages past they have been the only vessels used by the natives. The invention of the flying proa is one which would do honour to the most educated and ingenious of mankind, and yet it appears to have originated entirely with an unlettered people, the inhabitants of a few small, outlandish, and remote islands; and the natives are no less dexterous in the management of the proa than in the building of it. 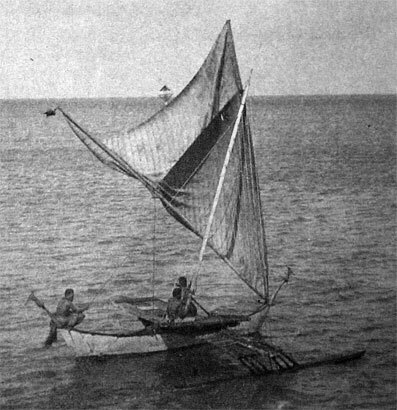 The flying proa is admirably adapted to the peculiar navigation of the Ladrones, lying as they do, all of them, nearly under the same meridian and within the limits of the trade winds; and therefore vessels employed in the navigation of these islands, and in passing from one to the other, require to be especially and peculiarly well fitted for sailing with a side wind; and when we examine the uncommon simplicity and ingenuity of the construction and contrivance of the flying proa, and consider the extraordinary speed at which it sails, we shall in each of these particulars 'find it worthy of our admiration, and meriting a place amongst the mechanical productions of civilised nations where arts and sciences have most eminently flourished'. The form and construction of the flying proa is in direct opposition to the principles of boat building as adopted in England and indeed in almost every other country in the world For as the rest of the world make the two sides of the vessel as exactly alike as possible those of the flying proa are totally different one side being round or bilge shaped whilst the other is flat and perpendicular as a wall but the head and stern of the proa are as exactly alike as possible and the vessel may be sailed with either end foremost but always with the rounded side to windward and the flat one to leeward therefore on the return voyage the boat is not turned round but the sail Indeed the boat never need be turned round but twice a year and that only when the trade winds shift which they do once a year only blowing six months in one direction and six in the opposite. Being therefore always enabled to know for a certainty the quarter from whence the wind will blow and that wind being always a side one throughout the whole range of the Ladrones the islanders are enabled to turn such knowledge to useful advantage and so they find it unnecessary that their boats should possess the power of tacking and working to windward or of sailing before the wind but exclusively that of reaching or sailing with a side wind. Therefore the Ladrone inventor places a very large sail on a very narrow form of hull indeed such a sail as would inevitably upset the proa in a breeze unless it were counterpoised against the force of the wind by some artificial contrivance. 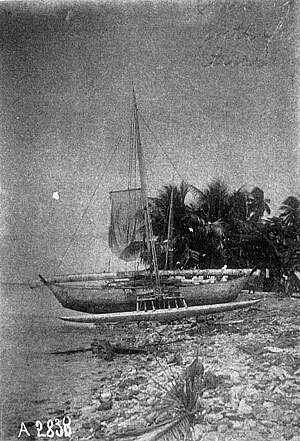 It has been already stated that the lee side of the proa is flat or in other words the shape of the hull is something like one half of a boat severed longitudinally and then the whole open side boarded up from stem to stern with straight planking; all which materially contributes to render it the more ticklish and easy to capsize But in order to prevent such a catastrophe the proa is fitted with an outrigger which forms a most important feature in the boat and one of its greatest peculiarities. 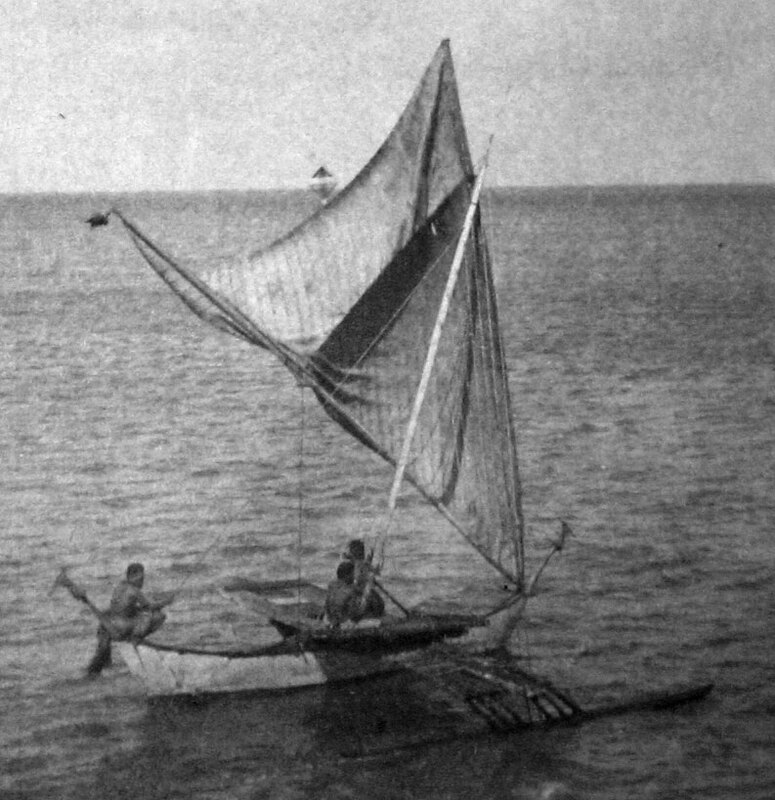 The outrigger consists of a frame made of bamboo poles affixed to the proa and standing out to windward At the extreme end of the frame is fastened a log of wood slightly hollowed and fashioned into the shape of a small boat The weight of the frame and log is intended to counterpoise the proa against the force of the wind acting upon the sail and to prevent the proa from being capsized. The hull of the proa is very neatly made and put together The bottom is of one piece made like the bottom of a little canoe very neatly dug and left of a good substance This bottom part is instead of a keel twenty six or twenty eight feet long The under part of the bottom is made round but inclining to a wedge and smooth and the upper part is almost flat having a very gentle hollow and is about a foot broad From this bottom or keel both sides of the boat are earned up to about five feet high with narrow planking not above four or five inches broad and each end of the proa turns up very prettily. The breadth of the proa depends in a measure upon the length but it seldom exceeds four or five feet amidships and is much less at the ends. The mast it should be observed although placed amidships longitudinally is not so latitudinally but stands in the bilge of the proa close to the weather gunwale and is fixed to the middle beam or bamboo of the outrigger. 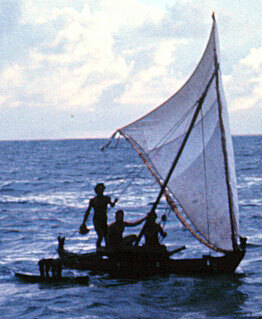 The sail is triangular or latine shaped but much wider at the foot and less lofty than the latines of other nations and although it looks not a large sail in the proa still when it is considered how long and narrow the hull of the proa is it will be found to be an enormous sail in proportion to the stability of the boat when viewed independently of the outrigger. The fore end of the yard is secured in a socket made purposely to receive it at each end of the proa The sail is also fitted with a boom so that it stands nearly as flat as a board and the boom is also used for furling the sail and rolling up a portion of it when the wind is heavy and such is the mode of reefing the sail of the proa. The sail is made of matting stuff and the mast yard boom and outrigger are all of bamboo. When the proa alters her tack for the return voyage, her crew bear her away a little to bring her stern up to the wind; then, by easing the halyard, raising the yard, and carrying the heel of it along the lee side of the proa, they transfix it in the opposite socket, whilst the boom at the same time, by easing off one part of the sheet and hauling on the other, shifts into the contrary or required position, when that which was the stern then becomes the head, and the proa is trimmed on the other tack. 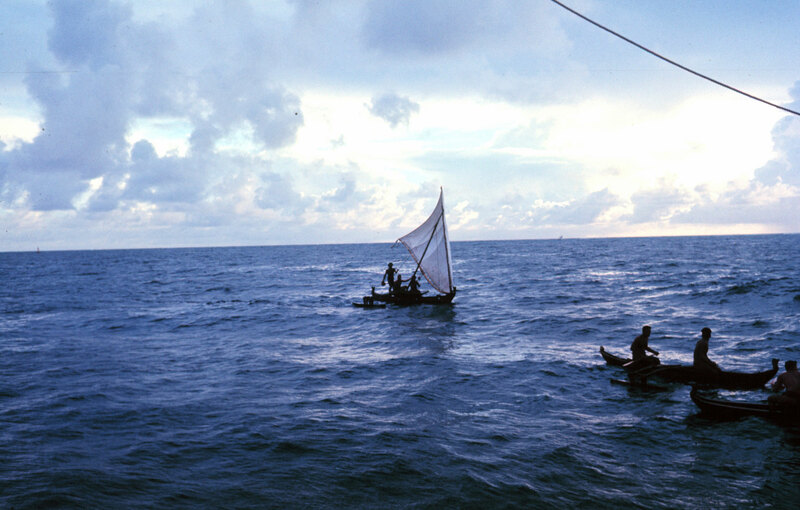 The proa generally carries a crew of six or seven, two of whom are stationed, one at the head and another at the stern. These steer the vessel alternately, with a paddle, according to the tack on which she goes. The duties of the others are to bale out the water when she leaks or accidentally ships any, and to trim, adjust, and attend to the sails. From the description given of these extraordinary vessels it will be seen how admirably they are adapted for ranging the Ladrone Islands and from the great power they possess in the very large sail the flatness of their lee side and their narrow form of hull assisted by the outrigger they are enabled to fore reach with immense power and without any apparent lee way. 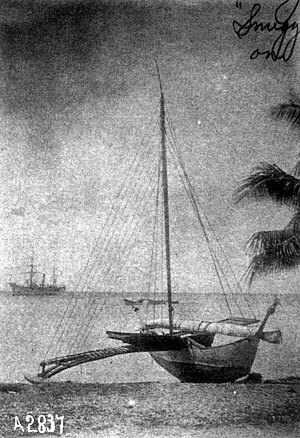 It is mentioned by Pliny eighteen hundred years ago that vessels navigating the seas to the west of Taprobane Ceylon had prows at either end to avoid the necessity of tacking And the same fact is also mentioned by Strabo who says they were built with prows at each end but without holds or keels 2 Still this mention by Pliny and Strabo does not appear to clash with the general impression of the early voyagers that the original notion was derived from the Ladrone Islanders. The peculiar mode of counterpoising the canoe when the pressure of the wind acts forcibly on the sail is also a very primitive notion. [*3] - In Pigafetta's Voyage round the World, A.D. 1519 to 1522, the flying proa is thus described: The chief amusement of the Ladrone Islanders consists in sailing about with their wives in canoes similar to the gondolas of Fusine near Venice but they are still more narrow all of them are painted either black white or red The sail is made of the leaves of the palm tree sewed together and has the shape of a latine sail It is always placed on one side and on the opposite side to form an equipoise to the sail they fasten a large wooden log pointed at one end with poles laid across and fixed in it which keeps the boat steady and admits of their sailing without apprehension their rudder resembles a baker's shovel that is to say it consists of a pole fastened into a plank They make no difference between head and stern as they have a rudder at each end They are excellent swimmers and have as little fear of the sea as dolphins. A modern attempt at the art of constructing a flying proa to sail in English waters was made in the year 1860 by a member of the Royal Mersey Yacht Club who assisted by the ingenuity of an able mechanic and boat builder on the Mersey appears to have been highly successful in turning out a veritable flying proa which was of course one of the greatest attractions and most extraordinary novelties ever seen on that river. This Anglo Ladrone proa was described as being 'highly scientific and solving many problems in the science of marine architecture. She is diametrically the opposite in every particular to all European vessels She has much greater length in proportion to her beam than any other vessel whatever Her two ends are exactly alike turning up prettily in the prow like manner of the ancient galley ending in a handsomely carved scroll The most surprising feature is that one of her sides is flat acting as a lee board and it is on this side that she always sails when by the wind The other side which is the windward one is moulded rounding in the manner of other vessels Her bottom or midship section is of a rounded wedge like form and has great length of floor On this side there is a strong framework or outrigger firmly built to the vessel and at the end parallel with the keel a log of wood shaped into the form of a small boat is strongly attached made hollow and decked over By this arrangement she is kept from oversetting it acting also as her ballast and giving the required stability This quality can be increased ad libitum It also acts antagonistically to the pressure of the wind on her sail when by the wind as the pressure increases so does she gain stability by gradually feeling the whole weight of the log boat as it is lifted out of the water She only draws about fifteen inches of water yet the flatness of her lee side and its clear run prevents deflection from her course when on the wind Her mast is placed exactly in the middle of her length perpendicularly but stepped on one side and can be lowered on deck at pleasure She has one sail which in its principle and working is as surprising and as novel as the boat herself It will turn round to any point of the compass, and working on a centre, it can be so adjusted as to act as a steering sail, as well as a most powerful means of propulsion. She can be run upon any rhomb line of the compass in a direct course merely by varying the angle of the sail It can be reefed to any degree required to meet the of the wind and retain its original shape this is effected by the simple and perfect process of rolling it up at the foot on the lower yard The general simplicity of the construction of the proa and ingenuity of contrivance in her sail and tackle is beyond that of any other vessel one mast one sail one shroud three blocks one halyard two sheets and braces comprise all her tackle The seamanship or manner of sailing her too is not the least part of the novelty Two hands in moderate weather one sitting at each end have perfect command over the vessel and she is steered by them alternately with a broad paddle according to the tack she is upon She sails either end foremost that which was her bow becoming her stern and vice versa She is never put about but when required to go on the opposite tack the steersman merely keeps her away until her sail fills at the opposite end that which was the fore leech becomes the aft leech and the end of the yard is passed under a notch to keep down the tack of the sail Thus all the confusion of tacking is done away with In case of a sudden squall a single halyard let go brings down the sail on deck immediately and the danger of the gaff sail and its complexity is avoided nor is there any jybing and its hazardous consequences to encounter Combined with all these desirable properties from the fact of the vessel requiring no ballast whatever beyond her stores she is as buoyant as a cork and being constructed throughout of wood she can never founder and is a life boat in principle Her prow at each end rising boldly up with curved lines enables her to rise to the sea and her length of floor and general buoyancy prevents any of those sudden and heavy plunges which take place with vessels loaded with lead or iron ballast and heavy spars She will rise with the utmost promptitude on the top of the wave or in scudding before the sea go over it from her superior lightness Swimming on an even keel and drawing so little water she can run over banks and get into shallows or make harbour when other vessels are compelled to keep at sea or wait a tide We have said nothing of her velocity or capability of passing through the water yet this is her most surprising quality. 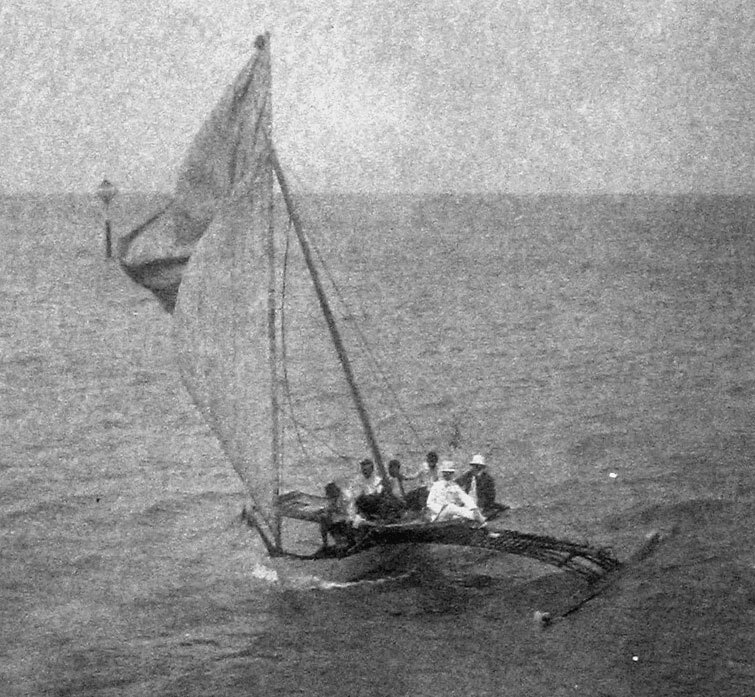 From the general curvature of her bottom and bold flanging stems she can be propelled through the water with a speed which would send any other sailing vessel bows under From this description it will be very evident to the scientific reader that her capability of speed is something very considerable We shall conclude with the statement that she carries three times more canvas according to the resistance of the vertical midship section immersed than the fleetest of our yachts.